The Kona Wozo is a versatile and playful fat bike with modern geometry, front suspension, and solid all around performance. The Kona Wozo is a highly capable and versatile fat bike that stands out from the crowd in this review and earned our Editor's Choice Award. Its modern hardtail geometry coupled with a 100mm Manitou Mastadon fork make it very comfortable, capable, and playful on the descents compared to its fully rigid competition, especially when the going gets rough. The Wozo is plenty capable on snow, but with slightly narrower 65mm rims and 3.8" Maxxis Minion tires, it's impressively versatile for use on dirt or mixed conditions as well. Its heavier than the competition but is still a reasonably good climber with a comfortable climbing position and a well appointed and roomy cockpit. The build isn't likely to turn heads but it's budget-friendly, functional, and comparable to the other models in this review, except for the suspension fork, of course. If you're looking for a fat bike for general everyday riding that you can use year-round and shreds dirt just as well as snow then we think the Wozo is very worthy of consideration. With the Wozo, Kona has crossed their Honzo hardtail with their Wo fat bike to create a hybrid of sorts, a fat bike that seems to blur the lines a little and is intended to be just as capable on snow as it is on dirt and regular mountain bike trails. The bike looks strikingly similar in both appearance and by the numbers to the Honzo, but with big 27.5" x 3.8" tires that work well in snow and soft conditions and still roll plenty fast for general all-around use. The Wozo is the only model we tested in this review that comes with front suspension making it by far the pleasant and capable to ride on anything rough. The suspension combined with modern geometry makes it a blast to ride downhill with a stable yet playful demeanor. Read on to find out how it compares to the competition. The Wozo shines in ways the other bikes in this review can't, most notably its performance on steeper and rougher terrain. The Wozo is the most comfortable and easy going bike to ride downhill in this review thanks primarily to its front suspension. It's hardly fair to compare it to the rest of the fully rigid models in this review since they are all significantly harsher and less forgiving than the Wozo on anything but the smoothest of terrain. It doesn't have much squish up front mind you, but the 100mm Manitou Mastadon Comp fork provides 100mm more travel than any of the other bikes we tested and really helps to take the edge off anytime the trail gets rough. If you're likely to ride mixed conditions or especially dirt trails that may feature rocks or roots on the descents then we feel the Wozo is probably your best bet from a downhill performance standpoint. In addition to the front suspension, the Wozo has good geometry numbers that make descending even more comfortable and surprisingly playful. While the geometry of this bike is nothing groundbreaking, it's more progressive and modern than any of the competition, especially for a hardtail fat bike. Thanks to the suspension fork up front, it has the tallest front end of all the models we tested which helps to keep the rider in a less aggressive and more relaxed descending position. The 68.5-degree head tube angle is among the slackest of all the models in this test, and combined with the front suspension help to give this bike a confidence inspiring front end when pointed downhill. The reach measures 475mm, roughly 20-25mm longer than all of the other competitors, with a moderate length wheelbase of 1181mm which is again the longest of all the models in this test. Those longer reach and wheelbase numbers help to give this bike its calm and planted demeanor at speed but with an impressively short 420mm chainstay length it is still plenty playful and manualing or getting this bike off the ground is relatively easy. Steep rocky terrain isn't the typical realm of a fat bike, but the Wozo takes it in stride. The cockpit setup of the Wozo also plays into its downhill prowess. The bike's short 40mm stem and 780mm wide handlebar with a stout 35mm clamp make for precise handling and a comfortable upper body. The fact that Kona also spec'd a quick release seat post clamp makes it easier to quickly lower your saddle for extended descents. Despite the fact that it is the heaviest bike in the test at 34 lbs 15 oz, the Wozo is a relatively good uphill performer, it is a hardtail, after all. Like all the other bikes in this review, little energy is lost when transferring energy from your legs through the drivetrain due to the stiff rear end of this bike, though you can feel a slight loss through the fork during out of the saddle climbing. It also has a nice steeper 74.5-degree seat tube angle that puts the rider right up above the bottom bracket with a slightly longer reach and a taller front end that results in one of the more comfortable seated pedaling positions of all the models we tested. The unfortunate side effect of this taller front end, and the short 420mm chainstays is that it is more prone to wandering if or when the climbing gets very steep or technical. Keeping your weight forward on steep climbs is a simple way to combat the light feeling front end. The Wozo loses a little efficiency over its competitors due to its heavier weight and squishy front end, but it still climbs pretty well regardless. Testers found there to be adequate range provided by the 11-speed SRAM NX drivetrain and never needed to get off the bike while climbing unless bogged down in too soft of snow. The traction provided by the 3.8" Maxxis Minion FBR tire is also excellent and hooks up well on snow and dirt alike. These tires are virtually the same as those that come on all of the other models in this review with the exception of the Trak Farley 5 that is clad with 4.5" Bontrager Gnarwhal tires that provide even more floatation and traction. As mentioned above, the geometry of the Wozo is the most modern and progressive of all the models in this test. Overall, the numbers aren't anything crazy, but they do break the mold compared to the competition. The head tube angle of 68.5 degrees isn't considered all that slack by today's standards though it is about half a degree slacker than any of the others in the test. The 74.5-degree seat tube angle is steeper than some of the competition and puts the rider in a nice seated pedaling position right up above the cranks. The 475mm reach is on the longer side and helps keep you from feeling cramped while climbing or descending while the 1181mm wheelbase is also the longest in the test, helping to give the Wozo stability at speed. Kona has managed to make the chainstays of the Wozo impressively short, only 420mm, by curving the seat tube above the bottom bracket to bring the bottom bracket and closer to the rear axle. These short chainstays help to give this bike its notably playful trail manners and make it easy to get the front wheel off the ground for manuals and popping off trailside obstacles. It's also got the tallest front end, this is due to the suspension fork that is setup at 100mm of travel but has 120mm stanchions. Perhaps our least favorite part of the Wozo's geometry is the wider Q-factor of 185mm, a full 20mm wider than that of the Rocky Mountain Suzi-Q. The wider Q-factor isn't a deal breaker, but it does make this bike feel a little less "normal" than some of the others. The bike also has a sliding rear dropout which can come in handy to accommodate for larger tires or to set the bike up as a single speed. The Wozo is unique in this review because it isn't fully rigid like all of the other models we tested. They've built the bike around their Fat 7005 aluminum frame with a Manitou Mastadon Comp fork with 100mm of travel up front. The Mastadon fork is one of only a few fat bike fork models on the market and it provides a little squish up front that really takes the edge off when the going gets rough. The fork has an adjustable air spring, rebound adjustment, and a compression adjustment dial that work well to dial it into your weight and preferences. There are also standard bottle cage mounts on both the top and bottom of the down tube and the frame is ready to accommodate an internally routed dropper seat post. The Wozo is also an outlier in this review because it is the only bike equipped with a SRAM drivetrain. The shifting duties have been left up to an 11-speed SRAM NX rear derailleur and shifter, an SRAM 11-42 tooth cassette, and a set of SRAM Descendant alloy cranks with a 30 tooth chainring. While this drivetrain setup works reasonably well, testers prefer the low-end Shimano components over low-end SRAM. For brakes, Kona chose the budget-friendly SRAM Level T with 180mm front and 160mm rear Centerline brake rotors. These brakes aren't our favorite but they do have a good lever feel and adequate stopping power and the "T" model is a step up in performance over the more basic Level. As with all of the other bikes in this review, Kona went in-house for the majority of their cockpit components. The front end has a nice 780mm wide Kona handlebar and short 40mm stem with a beefy 35mm clamp and comfortable Kona lock-on grips. On the back they have a Kona branded WTB Volt saddle clamped to a Kona XC/BC alloy seat post. They also thoughtfully added a quick release seat post clamp to expedite changes in saddle height. The Wozo has the roomiest and most comfortable cockpit of the models in this test. The Wozo rolls on a pair of 27.5" SUNringle Mulefut 65 rims laced to a Joytech 15 x 150mm front and a Formula 12x 177mm rear hub. The narrower rim width plays well with the 3.8" wide Maxxis Minion FBF and FBR EXO casing tires and gives them a slightly narrower and rounder profile that gives this bike a little more agility and versatility but decreases its floatation compared to bikes with wider rims and tires. Unlike all of the other fat bikes we tested, the Wozo comes with a Manitou Mastadon suspension fork with 100mm of travel. This simple fact alone makes this bike much better suited for rougher snow or trails than its fully rigid competition. It also comes with somewhat narrower, for a fat bike, 65mm wide rims and 3.8" wide tires that help to bump up the versatility factor. If you're likely to be riding a mix of snow and dirt or you're searching for a fat bike that blurs the lines and is capable for all seasons, then we think the Wozo is a good option to consider. It also has clearance in both the front and back to accommodate wider tires if you're interested in making it a dedicated snow riding bike. The lack of accessory mounts on the frame and fork make it less well suited to bike packing and adventure riding than competitors like the Rocky Mountain Suzi-Q or the Salsa Beargrease. At a retail price of $2,499, the Wozo is the most expensive model in our fat bike test selection. It has a relatively comparable component specification to most of the other models in this review, except for the Rocky Mountain Suzi Q, but it comes with a suspension fork as opposed to a rigid front end. Front suspension is a really nice feature and something that many riders can and will appreciate, especially at this price point. So, despite the slightly higher price of admission for the Wozo, we feel it is a good value for the rider looking for a fat bike with a more forgiving ride and a wider all-season bandwidth. Cruising on the Editor's Choice Award-winning Kona Wozo. Kona's blend of their Wo fat bike and their Honzo trail hardtail has resulted in the versatile and fun to ride Wozo. 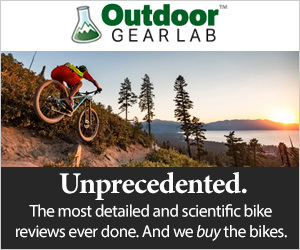 This bike boasts the most modern geometry of all the models we tested along with front suspension that gives it a distinct advantage on the descents over its fully rigid competitors in this review. If you're looking for a capable and playful fat bike that you can ride year round on snow, dirt, or both, then look no further than the Wozo. In addition to the Wozo reviewed here, Kona makes another fat bike called the Wo. The Wo ($1,599) comes with Kona's Fat aluminum frame, a rigid fork, a Shimano Deore 10-speed drivetrain, a handful of Kona's house-branded parts, and massive 4.8" Schwalbe Jumbo Jim tires.